Once you’ve tried these melt-in-your-mouth candies, you won’t want to go back to shop-bought ones. Make them for your family, or give them as special gifts or wedding favours. 1. In a small bowl, soften the gelatin in 190ml of water. 2. In a medium saucepan, gently heat the remaining 190ml of water with the sugar and liquid glucose, stirring until the sugar dissolves. Use a spatula to push down any sugar granules from the sides of the saucepan. Once the sugar has dissolved, increase heat and boil without stirring until the syrup reaches 121° on a candy thermometer, about 10 minutes. 3. Remove from heat. Add the gelatin mixture and stir until dissolved. 4. In a standing mixer, beat the egg whites until stiff peaks form. With the mixer on a medium speed, slowly pour in the hot syrup. Increase speed to medium-high and beat until cool, about 10 minutes. Beat in vanilla and rosewater. 5. Grease and line a 20cm x 30cm lamington tray with baking paper. Spray the baking paper lightly with oil and dust with a mix of 1 tablespoon of cornflour and 1 tablespoon icing sugar. 6. Pour the marshmallow into the tray and spread evenly. Let stand until set, 2-4 hours. Cut into squares with a wet knife (or use a cookie cutter to cut out shapes). Roll squares in remaining icing sugar and cornflour mix to coat. Place on wire rack to dry for a couple more hours then store in an airtight container in a single layer on baking paper. 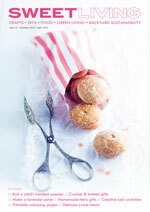 Check out our new online magazine, Sweet Living Weddings. 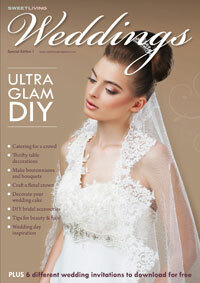 It’s a massive 180 pages worth of crafts, DIYs and tutorials for a glamorous handmade wedding. It features lots of beautiful projects, with instructions on how to make your own floral head wreath, boutonnieres and bouquets, plus there are cake decorating tutorials, reception styling tips, jewellery and accessory DIY projects, hair and beauty tips, and lots of real weddings inspiration. Take a sneak peak of the magazine here.